of worthy moments, dynamic action scenes, and a pinch of romance to ease the tension after long fight scenes. Being the second book/movie in the series, it did not disappoint fans. The third and final book in the series will be split into 2 movies like many other book series have done, for example Twilight, Harry Potter, and The Hunger Games, and is set to premiere the first part in early 2016. Now on the run from power hungry Jeanine, Tris and Four search to find allies and answers to questions about the mysterious box found under Natalie and Andrew Priors house and why Tris’s family sacrificed their lives for it. 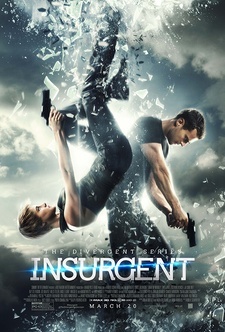 Side by side, Tris and Four face one challenge after another as they slowly unravel secrets about the past. New Characters and betrayals were introduced in this film, which made it different than the first film. It also added another layer to the already complex plot. Furthermore, we lost a few characters that we all loved to hate such as Eric, Max, Jeanine. Also this film was a great length, not too long and not too short either. Although this is a great movie, there are notable differences about the movie compared with the book. For example, Marcus, Four’s father, was a major part that was left out and most of the book deals with Tris agreeing and backing up him which creates a bit of a strain on her relationship with Four. Another good example is that in the book the entire part on how the secret information was released was completely different than what was portrayed in the movie. In the book, the way that the information being released was part of a infiltration to Jeanine’s computer done by Tris, Marcus, Cristina, and other Dauntless. Then there is how Jeanine’s death is different. In the book Tori killed her despite Tris trying to stop he and ends up even fighting her, whereas in the movie Evelyn, Four’s mother, flat out kills Jeanine with no fight from anyone. Overall, there are many differences between the book and the movie but it is still a good movie and I would recommend to anyone.